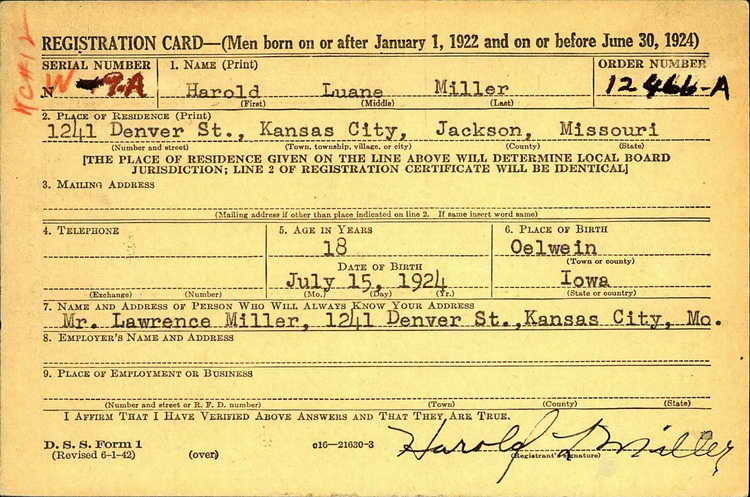 Harold L. Miller 89 of Kansas City Mo. passed away March 29, 2014 at Northcare Hospice House in North Kansas City Mo. A memorial service is scheduled for 11a.m. Monday March 31, 2014 at Heartland Cremation, 6113 Blue Ridge Blvd, Raytown Mo. 64133. A visitation will precede the services and begin at 10 a.m. at the funeral home. Mr. Miller was born July 15, 1924 in Oelwein IA. son of Lawrence and Margaret Miller. After his formative years he joined the U.S. Army in 1943 and served as a paratrooper during WWII, earning 3 Bronze Service Stars. Following his discharge in 1949 he became General Dwight D. Eisenhower's chauffeur and personal body guard. Following his civilian service to the future president he returned home and after a short time spent farming he moved to the Kansas City area and became a car salesman. He continued to sell cars until only a month before his passing. He was preceded in death by his parents, a stepmother, Charlotte Miller, brothers, Kenny and Tom Miller, and sisters, Marlys Watson and Jean Johnson, a stillborn son and great grand son, Ryan Conner. He is survived by his children, Janet (Jim) Vaughn, Linda (Bob) Ward, Margo (Gary) Wolken, Melody Miller, Sherri Elenz, Kandy (Andrew) Green, Enrique Orti, Dawn (Josh) Coleman, and David Miller, 25 grandchildren, and 41 great-great-grandchildren and his siblings, Bob Miller, Luane Miller, Sherry Baker, Char Young, Lana Miller, Kristy Hellman, and Jay Miller. Memorial contributions can be made to Northcare Hospice 2900 Clay Edwards Dr. N. Kansas City Mo. 64116, in Harold's name. Harold registered for the draft ca. 1941. Following his initial enlistment ca. 1944, Harold was transferred from the 82nd Airborne Division to Service Company, 508th PIR on 29 September 1944. On 16 February 1945 Pvt Miller was promoted to Pfc. Sgt Miller re-enlisted on 27 November 1945. 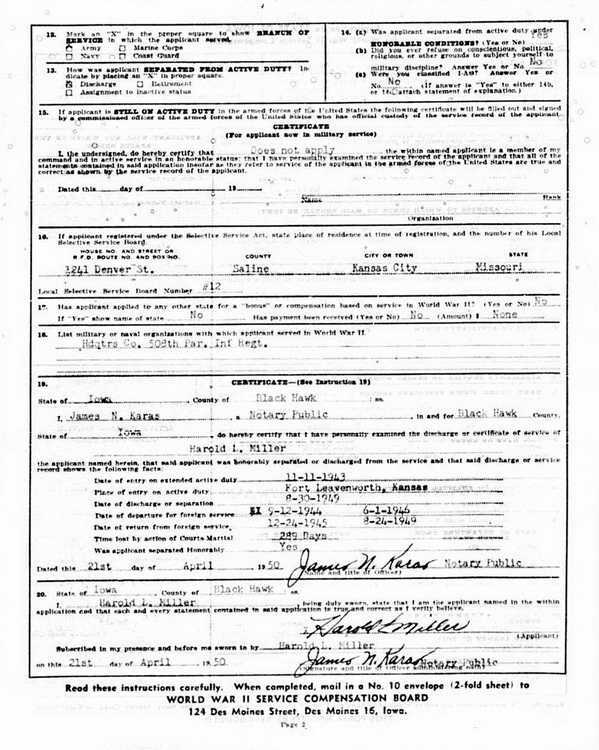 Although he returned to the U.S. on 24 December 1945, his application for the Iowa WWII Veterans bonus indicates that he departed for overseas duty again on 1 June 1946 and did not return until 24 August 1949. He was discharged on 30 June 1949. 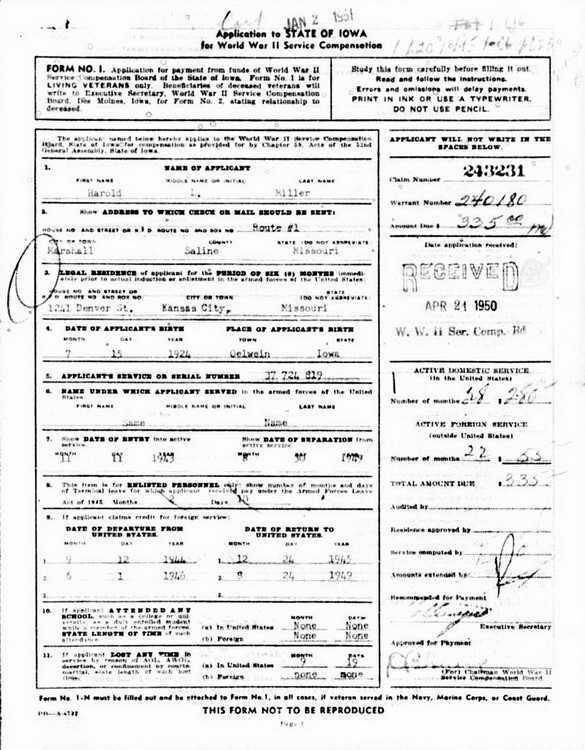 On 21 April 1950, Harold submitted this application for the Iowa WWII Veterans bonus. He was credited with 28 months of domestic duty and 22 months of foreign service. He ws awarded a $445 bonus. Somewhere with the initial enlistment and his final discharge, The bonus application states that he had 289 days of (approximately 10 months) time lost due to court martial.